Who is excavating in the ancient Indus area right now, and where and can students participate? J. Mark Kenoyer excavating and sampling the sediments associated with the HARP-excavated platform, Trench 43 (ca. 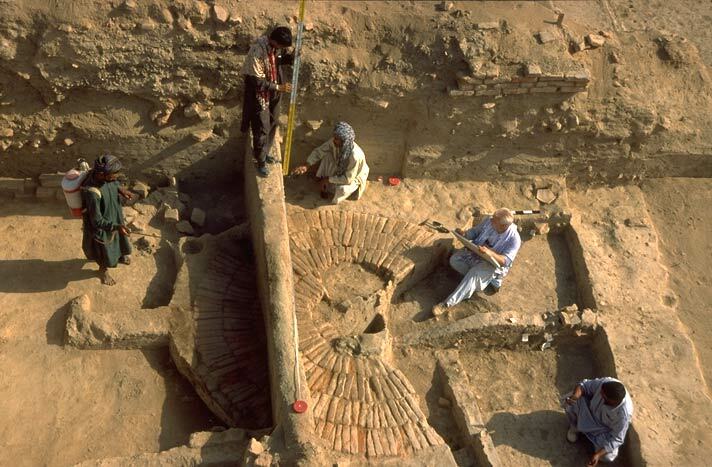 2100-2000 BC) at Harappa 1997. My principal experience has been in Pakistan, working at Harappa and its surrounding areas. At the moment, we are not doing field work. A German team, led by Ute Franke and her Pakistani collaborators, is still working in Balochistan. The Pakistan, Department of Archaeology continues to conduct surveys and excavation throughout the country. There are many archaeologists in India from universities and others from the Archaeological Survey of India involved in excavations and surveys on Indus sites. Take a look on the ASI web sites and you will see the places and names. Work in both Pakistan and India is being done primarily by nationals of those two countries, although there is some foreign participation on excavation projects in India. For political reasons, Pakistan is a difficult place for students to be allowed to work just now. The main players in India are certain universities (exp. M.S. University of Baroda, Deccan College, Pune), the central government through the Archaeological Survey of India, and various state archaeological services (e.g., Gujarat, Haryana, UP, Rajasthan, etc.). The most exciting work is being done by MS University Baroda, on small sites in Kutch-Kathiawad. Please contact them about student participation.